Servicios Trianon Residence | Apart Hotel in Recoleta, Buenos Aires - Argentina. We count on warm and very good decorated rooms. 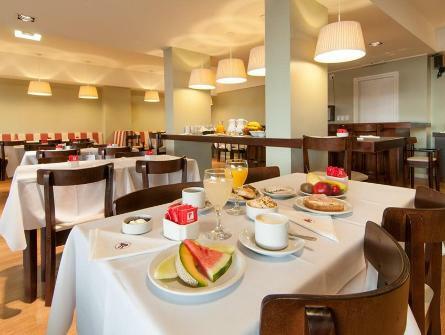 Buffet breakfast it´s served in our breakfast room from 7am to 11am. Coffee, different kinds of tea, chocolate milk, argentine infusion called “mate”, cold and hot milk, regular and skimmed yogurts, Orange and grapefruit juice. Croissants, toast (homemade bread, brown and white). Regular and diet jams, cream cheese, butter, our traditional “dulce de leche” (which is a lovely cream caramel, A MUST), ham, cheese, homemade cakes and loafs in assorted flavours, fruit salad and dry fruit, cereal, gluten free cookies, scrambled and fried eggs, freshly prepared. Facilities, we offer fitness center, Wi-Fi full coverage, garage, private security and bussiness center. Other facilities are safe-deposit box, air conditioning, laundry and dry cleaning, front desk 24hrs and medical emergency.. The staff of Trianon Residence is highly qualified and is at your disposal to ensure the most comfortable stay.